NEW YORK, Jan. 17, 2019 /PRNewswire/ -- Perry Ellis International, Inc. (PEI), announced today the second drop of five limited releases of the brand's archive capsule collection, Perry Ellis America®. As the nineties streetwear trend continues to grow, so does Perry Ellis America, with an evolving reinterpretation of its classic looks that defined an era. In homage to Perry Ellis originals, Capsule II pieces have been updated with a vibrant color palette of red, black, white, and heather grey, and classic bold logos. The collection features nylon tracksuits, washed denim, outerwear and more. The first capsule consisted of pieces that were direct reproductions of the original line, with Capsule II incorporating new designs that take inspiration from the original collection. 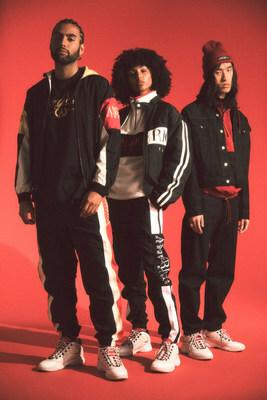 The classic tracksuit is now styled in black and white, while the rugby polo, originally in a faded grape, has been overdyed in a vibrant red. Logos, which had changed over time in the original collection, are now mashed up, resized and recolored for a more contemporary look across an assortment of heavy fleece and tees. An oversized puffer—a nineties staple—completes the look with the addition of a basketball sneaker in white and navy. "With Capsule II, we maintained the DNA of the original pieces and took it up a notch with updates that reinforce the rich history of heritage applications and branding," said Perry Ellis Creative Director, Michael Maccari. Capsule II also finds an update to an original collaboration with Levi's, highlighting an eagle image that is seen on several archival pieces. A yellow shell suit with red accents features the eagle prominently on its sleeve, while a varsity bomber finds it emblazoned across its back. Classic blue denim has been switched to black, with a classic emblem on the back of a denim jacket and on tab on the jeans. The collection is available at PerryEllisAmerica.com and ranges from $50–$395. Perry Ellis International, Inc. is a leading designer, distributor and licensor of a broad line of high quality men's and women's apparel, accessories and fragrances. The company's collection of dress and casual shirts, golf sportswear, sweaters, dress pants, casual pants and shorts, jeans wear, active wear, dresses and men's and women's swimwear is available through all major levels of retail distribution. The company, through its wholly owned subsidiaries, owns a portfolio of nationally and internationally recognized brands, including: Perry Ellis®, An Original Penguin by Munsingwear®, Laundry by Shelli Segal®, Rafaella®, Cubavera®, Ben Hogan®, Savane®, Grand Slam®, John Henry®, Manhattan®, Axist® and Farah®. The company enhances its roster of brands by licensing trademarks from third parties, including: Nike® for swimwear, and Callaway®, PGA TOUR®, and Jack Nicklaus® for golf apparel and Guy Harvey® for performance fishing and resort wear. Additional information on the company is available at http://www.pery.com.